If you’ve flown at all in the last six days — and I’ve flown every one of them — you know that Summer Time is here. Airplanes full of kids, crazy weather delays, and in my black uniform, it’s been hot hot hot. 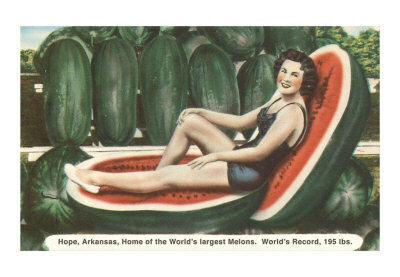 And where there’s Hot, there should always be Watermelon. As I’ve told you before, my writing group is cobbling together an anthology all about food. Memories, poems, recipes and other of our members’ favorite tasty morsels. My poem of the month for June is a haiku about my hot summer love of watermelon. I have waxed ecstatic about the joys of watermelon before; this poem was inspired my my second Best Food Moment Ever. Not my second-best, mind you; I have two Best Food Moments Ever, which is allowed because they both involve the same juicy and delicious fruit. And here we’re gonna tie it all together: my other Favorite Watermelon Memory is of a day out in Korea, which is where the member of our group who’s curating this anthology is currently living. (Thanks, internet!) See how it’s all a rich tapestry? So I’m driving to the airport the other day, in the middle of a six-day stretch, so hot in my black uniform and black car that I’m purposely driving practically in circles to only drive up shady streets, and my favorite local jazz radio station comes through, as they always do, with the perfect splash of musical refreshment. I’ve always felt a certain seasonal affinity with summer. Ushered into this wide and wacky world on its first day, we’ll consider me, for the purpose of wrapping up this post, something of an expert on the topic of How To Enjoy Your Summer Time The Most: 1. Check out our yummy anthology as it comes together right before your eyes at Twelve Months of Tasty Morsels. 2. Listen to plenty of jazz. And 3. Don’t forget the watermelon. I do love my watermelon, man. If I could listen to jazz, my life would be better? Cool! That’s a clear goal. I am so far from jazz (John Zorn is my closest point). Is there a gateway drug? Will KUVO play it continually for me? The other two items are easy! KUVO strays from a strict Jazz Mission on the weekends, but during the week, they will absolutely play it continually for you, and tell you all about it while they’re doing it. We have invented an hilarious and especially inebriating drinking game wherein you take a shot every time they say the name Paquito D’Rivera (their favorite Cuban composer and sax man), but we never play it as we mostly listen to KUVO in the car. By way of an introduction, you might sample some of the more awesome female organists like Shirley Scott or Akiko Tsuruga. Your first taste of Dinah Washington is free, but be warned: she’s a slippery slope.